In the past, popcorn machines have traditionally been used for commercial purposes. But over the past 20 years or so, popcorn machines have grown in popularity for home use, especially home theater popcorn machines. With the explosion of home theaters and wide screen home televisions and surround sound systems, popcorn machine use in home theaters has grown with these changes. Cold Winter Days are here, it is great time of the year to add a home theater popcorn popper to your home theater room. It is a great compliment to any home theater and it will definitely liven up the atmosphere with some fresh popping popcorn while enjoying a great movie. And the Holiday Season is Here...Popcorn Machines are great gift items.. And of course we all know how fun popcorn can be while watching our favorite teams! Our popcorn machines make great tasting fresh popcorn right out of the hot oil kettles. Scroll down to the list below to see the variety of options of popcorn machines we feature for home theater set-ups. If you have any questions, you can email us at funfoods@cox.net or give us a ring at 757-473-8951 for friendly customer service. Which size Popcorn Machine is good for your Home Theater? Popcorn Machines with 4 or 6 oz kettles make great home theater popcorn machines. The quantity of popcorn you can put in the kettle is measured by the size of the kettles. For 4 oz kettles, you can put 4 oz. of raw Pocorn seed. For six ounce kettles, you can put in 6 Oz's. of popcorn seed and so on. Most popcorn kettles allow you to put in up to two extra ounces of popcorn. As far as the amount of oil necessary to create great tasting theater popcorn, the general rule is two thirds popcorn and one third oil. All of these Home Theater Popcorn Machines found below are table top sized. An optional popcorn cart with wheels or pedestal can be purchased separately. Great Portable Popcorn Machine and Cart for all you Coca-Cola fans who enjoy a great tasting Coke and some fresh popcorn. Will be a great fit for any home theater or game room. This unit stands 4 feet height and contains a 2.5 oz stainless steel popcorn kettle with a built-in stirring system. There is a compartment in the base of the unit to store supplies, making it easy to keep the cart well stocked and organized. The Coca-Cola® Series Popcorn Cart has an easy-to-clean design, and its accessible height makes serving a snap. Also makes for a great gift! The Gatsby 4 oz. Popcorn Machine. The Gatsby Popcorn Machine is designed to be very visually appealing for any home theater or fun room, and comes in the color options of red or black. The Gatsby Popcorn Machine features many of the same great qualities of the Paragon Popcorn Machines -such as tempered glass panels and a high-output kettle - while offering you a budget-friendly option for your concession and entertainment needs. The Gatsby is made exclusively in the USA and is the lowest cost US made 4 oz. popcorn machine on the market! Easy to clean surfaces. Pops 92 oz. of popcorn per hour. At this price, everyone can now afford to own a high quality popcorn machine for their home...Grab one today at this great price! The CCP-510 Popcorn Machine is a little smaller version of our CCP-610 popcorn machine, but this popper makes for a great home theater popcorn machine. The popper stands 4 foot 5 inches tall. Despite its old-fashioned street-corner look, the Movietime Popcorn Cart is designed for use in your home so you can prepare hot fresh popcorn any time. Being a little smaller in width and height, permits this popcorn maker to fit into smaller home theaters and locations within the theater. But this cozy little popper still can still pop up some fresh and delicious theater style popcorn. The CCP-510 Popcorn Machine and Cart Combo features a stainless-steel kettle with a built in stirring system and kernel catcher to keep out the unpopped kernels. 4 oz kettle included. The CCP-399 Vintage Popcorn Machine and Cart. This popcorn and cart combo is yet the smallest in the CCP line, 48 inches high. Compact for smaller spaces and a 2.5 oz popcorn kettle is included in this package. Will fit in smaller spaces in your home and is economically priced to fit any budget. Great compliment to your home entertainment and party needs. Popper includes tempered glass windows and heating lamp and easy to clean features. It also features a stainless-steel kettle with a built in stirring system and kernel catcher to keep out the unpopped kernels. Additionally, there is a compartment in the base of the unit for supplies storage, making it easy to keep the cart well-stocked and looking tidy. The CCP-610 6 oz . Popcorn Machine is almost identical to the CCP-600, but this Nostalgia Electrics Popcorn Machine is a step up in that it has a great looking unique lighted concession holding area to display your candy items or other snack items of your choosing. This 59" tall vendor-style popcorn and concession cart will be the hit of every movie night or party. It not only pops up to 8 1 oz. popcorn bags per batch, but also has a lower concession-type display case for all your movie treats. Large 6 oz. stainless steel kettle with built-in stirring system. Versatile popcorn maker top can be used without the base. Handy and convenient utility shelf for popcorn preparation. Go Hollywood style in your Home Theater with this Benchmark USA Premiere Cinema Style 4 oz. Popcorn Machine and Base Combo. Economically priced to fit any one's budget, but yet classy to fit into any game room or home theater. Great starter commercial popcorn machine. Bring the movie theater experience right into your own home with the Premiere Hollywood Style Popcorn Popper and Pedestal Combo! The pedestal base has a two shelf storage compartment for all of your popcorn supplies. This Hollywood popcorn pedestal base will be a great compliment to your Premiere Popcorn Machine especially in a home theater setting. Unique and eye catching take 2 Movie production graphics featured on this popcorn pedestal. The user-friendly design of this popper allows for in-field repairs to be made easily with standard household tools. 3 Year parts warranty. Click on link above for more details and photos. Benchmark USA Metropolitan Home Theater 4 oz. Popcorn Machine. Inpired by the art deco architecture of the late 1920’s and 1930’s, these popcorn machines are ideal for home theaters. Its unique design enables it to be placed against a wall for a minimal space requirement while still providing an attractive visual impact. Ordinary popcorn machines have the graphics and cosmetic appeal on the back of the popper making them unsuitable for wall placement. The optional pedestal base provides storage for all of your popcorn supplies while placing the popper at the ideal operating height. This commercial quality popper features a aluminum food-zone, 20 mil anodized kettle (for easy cleaning), a heated warming deck to keep the popped corn fresh for hours, old-maid drawer (for un-popped kernels), tempered glass panels and a three year parts warranty. Benchmark USA Metropolitan 4 oz Kettle Home Theater Popcorn Machine and Pedestal Base Combo. Inspired by the art deco architecture of the late 1920’s and 1930’s, these popcorn machines are ideal for home theaters. Its unique design enables it to be placed against a wall for a minimal space requirement while still providing an attractive visual impact. Ordinary popcorn machines have the graphics and cosmetic appeal on the back of the popper making them unsuitable for wall placement. 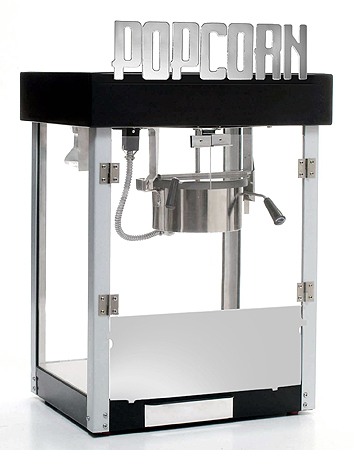 The Metropolitan Popcorn Machine Pedestal Base provides storage for all of your popcorn supplies while placing the popper at the ideal operating height. The color of the base is black and white with a popcorn logo on a base that is designed with a nostalgic cinema flair. Great price at only $594.98! Paragon Professional Series 4 oz Popcorn Machine and Stand. This combo features a stainless 4 oz Popcorn Machine and a matching stand with textured black powder coat finish. The base features a stainless steel top to match machines corner posts. The stand is an exact fit for the 4 oz popcorn machine. New for your home theater from Standard Concession Supply.....4 oz Paragon Red Cineplex Popcorn Machine. Designed for today's home theaters and game rooms. Features color popcorn holder design graphics on the doors on serving side. This 4 oz home theater popcorn machine is designed with the home user in mind as the cord is in the back and the graphics and storage door facing the operator. The Cineplex also features a hard coated anodized aluminum kettle which distributes the heat evenly and makes it easy to clean. Plus, added bonus of a stainless steel food zone and tempered glass panels, and old maid tray, and a built in warming deck. Complete your home theater or game room set up with this Red Cineplex Popcorn Machine and Matching Base Combo. Base allows for ample storage spacer with the two shelf set-up. Matching red stand built to fit a custom "single unit" look for the Cineplex 4 ounce popcorn machine. Another new popcorn machine from Paragon International...designed to fit the decor of today's home theater and game rooms. This popper features a new antique copper color that is all the rage in high-end home accents. This popper is priced very affordably for all that you get! The new color is formed from a pitted, powder coated material treatment. Designed with the end user(you) in mind, the power cord is placed in the back, graphics and doors in front. This a 4 oz consumer centric popcorn machine. Pops 92 one-ounce servings of popcorn per hour. 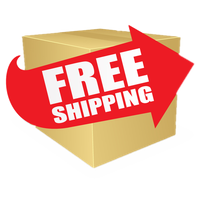 Includes high output, hard coat anodized aluminum kettle that is easy to clean! Built in warming deck is included to keep your popped popcorn fresh for many, many hours. Made in the USA. Cineplex Popcorn Machine and Stand Combo. Take your home cinema experience to a new level with this new antique copper color 4 oz home theater popcorn machine and matching stand. The matching antique copper stand included here is built to fit for a custom "single unit" look and has a wrap around door. Graphics and door are in front, while the cord is in the back presenting a perfect aesthetic looking popcorn machine and stand. The new antique copper color is all the rage in high-end home accents! Upgrade your home today with this very fashionable popper and stand! Paragon Theatre Pop 4 Popcorn Machine. This full-featured popcorn machine is ideal as a home theatre popcorn machine or game room popcorn machine. The Theatre Pop 4 Popcorn Machine is economical, easy to clean, easy to operate, and produces delicious, theatre-quality popcorn in minutes. And you can get our 4 oz pre-measured theatre pocorn in our popcorn supplies store. Healthy snack and provides great family fun and entertainment. Compact design-16" wide by 14" deep- is ideal for small spaces and makes a great countertop popcorn machine. Great gift for someone on your Holiday or Birthday List! Lifetime Warranty on this American made Popcorn Machine! You can't beat it! Paragon Contempo 4 oz.Popcorn Machine. The Classy and Sophisticated Popcorn Machine from Paragon. Pops 92 oz.of popcorn per hour. The life of the party! Our streamlined Contempo Pop machines have a modern look well suited for many businesses, clubs, bars, and home theaters. The gloss black cabinet has clean, bold graphics and smoked glass side panels. This Paragon 4 oz. Contempo Popcorn Machine is a full-featured machine and is easy to use and easy to maintain. Elegant and sophisticated to fit the decor of any home theater room! Life-time warranty on this American made popcorn machine when used for residential purposes! Grab one today for your home theater or as a gift. This gift will be appreciated for a lifetime! This American made Popcorn Machine is quality number one. Nicely designed and very sturdy and made to last for many years. Impress and delight your freinds and family with this beautiful antique style popcorn machine. King of Home Theater Popcorn Machines. Makes watching movies at home more fun and creates the effect of being right at the movie theater. And the unique nostalgia design adds to the atmosphere and decor for many home theaters. Freinds and family members will also appreciate greatly this unique and quite attractive popcorn machine. The Paragon 1911 Original 4 Ounce Popcorn Machine will pop a full cycle of popcorn every 3 minutes. Optional Popcorn Cart can be purchased seperately. See below for details. This popcorn machine will be a great addition for any home theatre or gameroom. Create a wonderful aroma. And enjoy great tasting popcorn with our pre measured 4oz. packets of movie theater style popcorn, oil, and buttery flavored salt-found in our popcorn supplies section. Lifetime Warranty on this 4 oz. popcorn popper! Makes a wonderful holiday, birthday or anniversary gift for the popcorn lover on your list or for the family who really enjoys popcorn! For the final touch for your home theater room, put your popcorn machine on a cart for great mobilty and easier access. The visual affects of a popcorn machine together with a popcorn cart is striking. This cart is for the Paragon 1911 antique style and theatre pop 4 oz. popcorn machines. Bright red frame with yellow graphics. Popcorn machine can be purchased separately through above link. Popcorn machine is not included in this offer, only the popcorn cart. Paragon Contempo 6 oz. Popcorn Machine. Pops 113 one-ounce servings of popcorn per hour. Fits right on the counter top. The life of the party! The 6 ounce Contempo Pop Popcorn Machine has a modern look well suited for many businesses, clubs, and homes theaters. The gloss black cabinet has clean, bold graphics and smoked glass side panels. This Paragon 6 oz. Contempo Popcorn Machine is a full-featured machine and is easy to use and easy to maintain. Elegant and sophisticated for any home theatre. 3-year warranty on this American made Paragon Contempo Pop 6 oz. Popcorn Machine. Did you find what you are looking for? Check out our popcorn machines for sale page where you will find a combination of home theater and home entertaining popcorn machines, commercial popcorn machines, as well as, a great list of popcorn machines for gifts. For home theater popcorn supplies, head on over to our popcorn supplies page. Commercial Popcorn Machines for Home Theaters Standard Concession Supply features a great variety of popcorn machines for home theaters, game rooms, and commercial use. Even popcorn machines with your favorite college logo. Also include a full line of Nostalgia Electrics fun food products to make all your home parties come alive...including chocolate fondue fountains, mini snow cone, cotton candy, and popcorn carts, mini hot dog roller, home vend soda machines, and more.